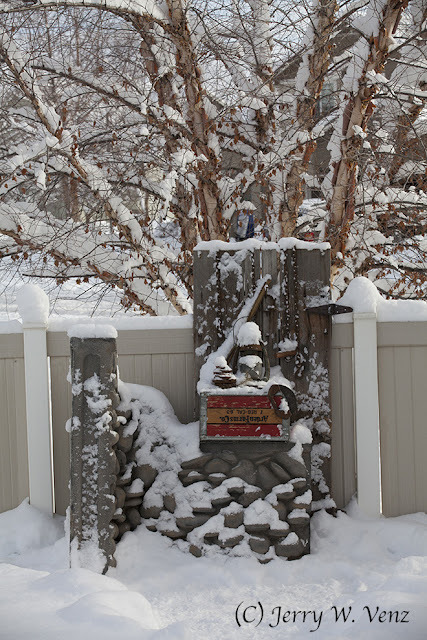 When photographers can’t find a rustic country scene locally to photograph in the snow we build it in our backyard! Here in our urban community of Meridian, Idaho it’s harder and harder to find the country farms and old barns I love so much. As the housing developments grow those farms and barns are being demolished rapidly. Two barns with their farm houses—even all the trees—were knocked down last year here in Meridian and the remaining two farms with barns are for sale making way for more housing developments. We got six inches of snow here in early December (2016) and then six more, so by the time I got my act together I had to dig out an area upon which to place my base and farm course door for a level set! One of my tricks so my set would collect snow more easily is to tilt the whole set back against the fence. Based on past snow fall here in Meridian this trick was necessary….not this year! Here’s my whole set after I removed enough snow to make my tools and lantern visible! 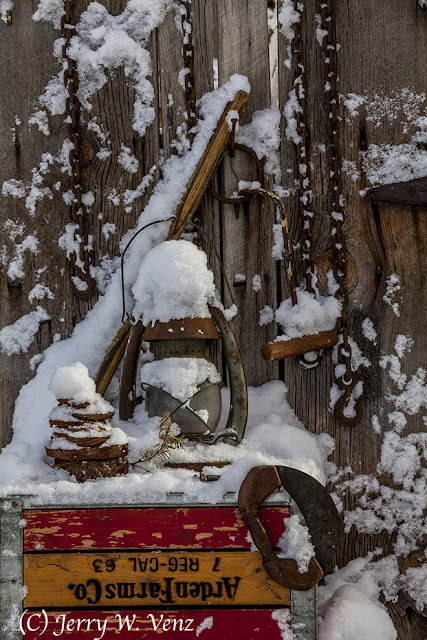 I used a manual, rubber bulb, air blower and small brushes to remove the excess snow for a realistic look. And the snow just kept coming! It turned out that this season’s snowfall, from December 2016 to January 2017, was the most ever recorded in the Boise area. The first images I made of my set looked good, but with all the snowfall (overcast sky) the lighting was always too flat, so I kept the set up for a couple weeks util we got a break in the weather and the sun came out. That’s when I took the final image. The low sun hitting my set from the right gave me the three dimensional quality I wanted on the snow. Hope you enjoyed…’Til next week.